Here, the effects of treating preclinical non-small-cell lung cancer models with ATN-224 (lower two boxes) is seen in a reduction of tumor burden (dark purple) and cancer cells (brown). Northwestern Medicine® scientists have demonstrated how inhibiting an antioxidant protein – which cancer cells depend on for survival – could produce an array of new cancer treatments. It’s a method opposite the long-standing approach of increasing antioxidants in cancer therapy. Typically, reactive oxygen species (ROS) – oxidants – are constantly generated and eliminated within the body, as their buildup results in significant damage to cell structures. Cancer, however, uses them to maximize its ability to rapidly reproduce. To do this, they rely on intracellular antioxidants to keep ROS levels elevated but controlled. Published in The Journal for Clinical Investigation, the preclinical research capitalizes on the fact that even cancer cells possess a vulnerability to ROS overload. With that in mind, Andrea Glasauer, PhD, considered the ramifications of inhibiting the antioxidant SOD1, a protein that accelerates the cells ability to eliminate superoxides. The lab used in vitro and in vivo models of non-small-cell lung cancer (NSCLC) to test its hypothesis. NSCLCs represent more than 80 percent of all lung cancers, the leading cause of cancer death in the United States. Navdeep Chandel, PhD, professor in Medicine-Pulmonary and Cell and Molecular Biology, has shown that by inhibiting antioxidants, it is possible to kill lung cancer cells. The other fortuitous thing was collaborating with Andrew Mazar, PhD, research professor at Northwestern University’s Chemistry of Life Processes Institute and director of the Center for Developmental Therapeutics, who designed ATN-224, a drug that targets SOD1. 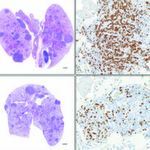 Chandel demonstrated that ATN-224 was able to reduce tumor burden in a mouse model of NSCLC. The findings offer proof that antioxidant inhibition has potential clinical applications as a single agent, or in combination with other drugs, for treatment of the disease. Laura Sena, a student in the Northwestern University Medical Scientist Training Program, and Lauren Diebold, a student in the Driskill Graduate Program in the Life Sciences, also contributed to the project. The work was supported by the LUNGevity Foundation and the Consortium of Independent Lung Health Organizations convened by the Respiratory Health Association of Metropolitan Chicago; National Institutes of Health grants R01CA123067, F30ES019815 and T32-HL76139; a Dixon Translational Grant; and a Northwestern University Malkin Scholar Award.